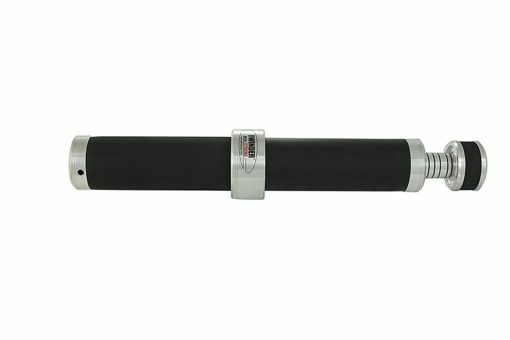 Home / Xtreme #3 / SideWinder® Pro Xtreme #3 Hand, Wrist, Forearm Exerciser 2″ diameter Handle. Fat Grip Training for serious Grip Strength! PRO XTREME #3 CUSTOMER REVIEWS! This is the Heaviest, longest, thickest and strongest built-in resistance of the Sidewinder line. Ready for Fat Grip training. Full 2 inch diameter grip size! 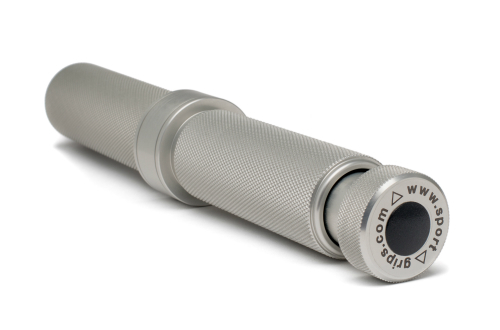 Very solid parts including steel tubing, machined aluminum and neoprene handles. Built-in resistance! Contains adjustable, calibrated tension gauge that accommodates the youngest of beginners to the elite athlete. Maintains the same resistance level no matter how many revolutions you twist the handles. What sets us apart from our competitors is the combination of constant tension, exaggerated range of motion, single/double hand usage and multiple hand positions makes the Sidewinder Pro Xtreme #3 an essential tool for anyone pursuing larger well developed forearms. Controlled motion is one of the best features to prevent injuries. Resistance and repetition coupled with consistency are the keys to making YOURS a success Story! Compact enough to go where you go, It’s soon to become a favorite of your workout regime. We stand behind our products because they are made TOUGH! Built to last for those who are serious about grip strength! All SIDEWINDER® products come with a LIFETIME WARRANTY. Buy two or more and the shipping is Free! who are serious about grip strength and a desire to break all the rules. 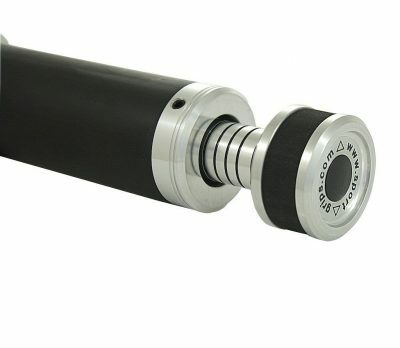 *Besides the quality, our adjustable calibrated tension knob makes all the difference. You can make as many changes to the resistance as you would like accommodating the youngest of beginners to the seasoned athlete. 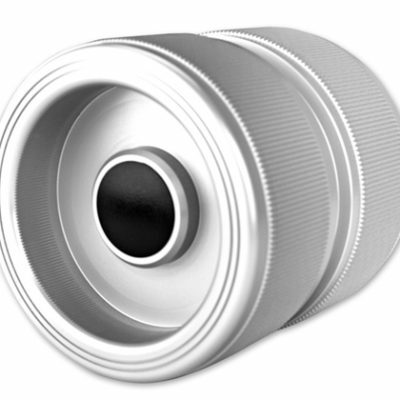 *The tension knob sits on a steel roller bearing allowing ease of adjustment. *You can turn the sidewinder endlessly in one direction as many times as you would like while maintaining the same resistance, this means you can choose the part of the forearm you wish to exercise. 5.0 out of 5 stars Losing your grip? Beginnings of arthritis and inflammation! With the SideWinder Pro Xtreme I can work through the pain and loosen my hands quickly and even the pain I have down to my elbows goes away after a few brief turns. Take your time, start easy at the torque setting but no matter what setting always grip firm. When you use an exerciser like this make it part of your workout routine, not while watching tv, at the office desk, etc. as might be the temptation. Stand up and work it – in front of you, behind, above, over/under grips, side by side and so on. I will often use mine between sets on other strength exercises like curls – talk about accelerating the burn! As I said, I recommend in combo with a gripper like Captains of Crush – they work well with each other. Work hard at this like any routine and after a short time you’ll be impressed with your veiny forearms! In my opinion, get the Pro Xtreme instead of the #2 model – you will want the larger grip and I can make this so easy to turn my grandson can do it and/or my wife can use it at her own settings. No sense in buying something for slightly less when you can start at beginner with this unit. Unit is heavy, will outlast me and the operation is totally silent. Love this, it’s perfect for training forearms while at a desk, or watching TV. I find it works the extensors more than the flexors, but it absolutely works both, and very well. Very difficult to even move it at the highest level of resistance (which is great), so I recommend less resistance and more reps to get more of a pump. Haven’t used it long enough to get measurable results (only a few days), but I am sure that forearm gains are not long to come. Bought this to help strengthen my wrists/hands/forearms. So far so good. I’m really enjoying it both at my desk at work and on the couch at home. It’s got a good weight too it and feels well constructed. The resistance goes from fairly easy to nearly impossible – I’m a pretty average guy. It’s especially nice to use at home. Makes watching Netflix a bit more productive. It’s a bit expensive, but I figure it’s something you buy once. 5.0 out of 5 stars Best forearm trainer on the market. This thing is the forearm trainer to end them all. Insane build quality, perfectly smooth action and adjustment. I’m not sure how the mechanism inside is designed but the resistance is perfectly uniform throughout the movement unlike various hand trainers with crudely designed springs that are very difficult at the peak of the range of motion and easy at the bottom. I have not used this for any length of time to be able to report results but I have trained my forearms in a multitude of ways and already this provides me with a good challenge. HIGHLY recommend and worth the money for sure. 5.0 out of 5 stars only buy if you want to improve the size of your forearms.. follow directions! WORKS great.. use the product as directed by the manufacturer. I have read some of the reviews.. The negative reviews are hilarious.. I have used the plastic forearm machine and it breaks after three months of use.. the sidewinder is made of steel and should last a long time.. nothing last for ever.. if i need another one I will buy another one..
Ok, this thing showed up at my house yesterday. I was so fired up about it. The thing’s built like a tank. The 2″ handles are perfect for my hand. The company even sent a suggested list of 4 exercises to do, and what set / rep scheme they recommend for noobs. Fast forward about 15 mins and it is slipping around because my hands were drawning into a claw. The form breakdown got rough, but this thing is very forgiving at that. At least at the level I’m at. To sum it up: would I buy it again? In response to that, I just ordered their OTHER wrist trainer that looks like you’re screwing the top of a jar. So “yes”, I would buy it again. When driving a desk, it’s nice to have a physical distraction. In addition to captain of crunch grippers, I use the sidewinder when I’m on calls. The adjustable tension allows you to switch up your workout from some high resistance twists to high reps. I’ve had the product for over 6 months, and have not had an issues with the tension or smoothness of the motion. The rubber grip does get a little gross, but easy enough to clean as needed. Use it 3-4 times a week. Feels really well made. Smooth motion. Though it was spring resistance before I bought it but it is not. Much better this way though without the recoil. Resistance goes from easy to almost impossible. Really nice peice of equipment. Hits forearms from every different angle as you try different grips. The torque of this at maximum is awesomely strong. 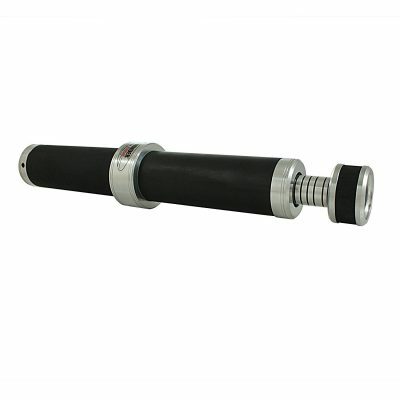 Can be adjusted to any resistance and works very smoothly. Best piece of exercise equipment i use. Works like described. The tension can be changed pretty finely and goes up beyond what is can currently do. Absolute genius idea and a rock solid product. I just got mine and love it. the quality is awesome and can’t be any simpler to use. and i can feel the burn in a minute in my forearms. thanks for coming up with this idea. you do deserve a nobel prize for this invention. 5.0 out of 5 stars Well worth it! This is by far the best piece of forearm equipment I’ve ever used. I’ve only been using it for a few weeks, and my grip/forearms are developing rapidly. SideWinder has an exceedingly wide range of intensity. I would strongly recommend it to anyone looking to improve forearm strength; a PT patient, a 400lb NFL player, or anyone in between. It’s built solid as a rock, and backed up by a lifetime warranty! If you’re on the fence, go watch a few Youtube reviews. 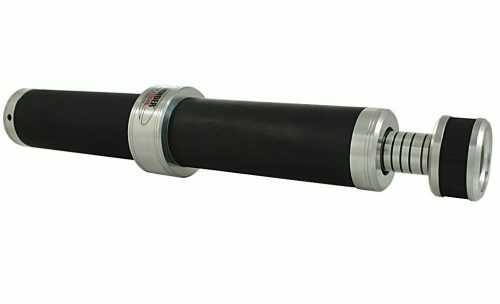 This thing is built like a tank…it’s much more convenient, and probably more effective, than a pipe and rope type wrist roller (you don’t waste energy holding weight up with your shoulders.) I am extremely happy with this and believe I’ll be using it as a part of my hand strength/health routine for a long time. Quality design, quality materials and very efficient and effective at developing forearm mass and strength. If you desire eye popping forearms just get the Sidewinder Pro and follow the script, my forearms are 17.5 inches and quite ripped, I wrestle the Sidewinder for circa five minutes every other day for the past 18 months. Where do I start? This thing is the most challenging and consistent forearm workout I have ever had. My hands, my grip, my forearms, everything feels tight and worked over after 1 session with this tool. It is heavy, and built like a truck, I get the feeling I could go out and use it as a baseball bat for a few innings before it showed any signs of breaking. It is expensive, but I get the feeling it is the last piece of grip assisting equipment I will ever buy, which makes it totally worth it. This thing will blast your forearms. I’ve been using it for over a month now and feel a great improvement in my grip strength. I do (3) sets of (20) at the first black mark now, and my forearms are on fire when I am done. Great addition to my home gym. Glad I finally decided to purchase this. Was looking to add grip strength and size to my girly forearms and this is working well. first 2 weeks of using it every other day is noticeably paying off. New muscles I haven’t seen are popping out and my strength and stamina in the forearms and hands has greatly increased. Glad I pulled the trigger after leaving it in my cart for months! 5.0 out of 5 stars Expensive, but worth it. I have the ProExtreme… expensive, but worth it. 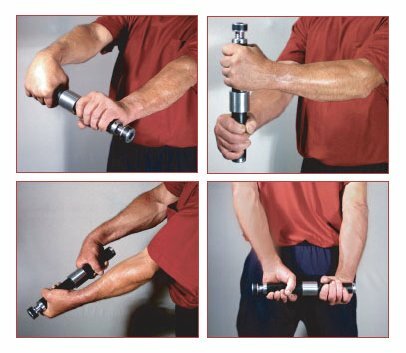 Gives a solid workout on forearms and improves your grip. Great tool for building hands, arms, wrists, I love quality built tools and this fits that bill. Well made, extremely efficient workout gear. I use this to strengthen my forearms and warm up my elbows prior to lifting since I had previous lateral epicondylitis surgery. This is expensive but every aspect of convenience is built in, and this is foremost an excellent way to build and keep arms and grips in shape. It is a unique tool, exceptionally well built, and honestly worth the money if you want one. I also bought the Grip Twister. 5.0 out of 5 stars A must-have for any grip strength enthusiast. This is an invaluable tool for those wanting to make some serious gains in grip strength and forearm mass. is solid. Worth it’s weight in gold.